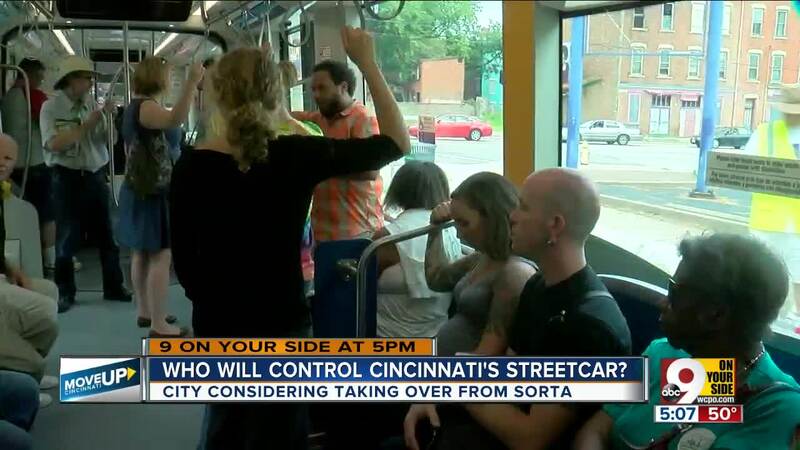 CINCINNATI — City Council got an update Tuesday on some lingering proposals to revise the streetcar's operating procedures, after ridership and revenue continue to lag behind projections. Among those ideas still being considered: making the streetcar free and terminating or renegotiating the streetcar's management contract with the transit authority. The biggest issue facing the streetcar more than two years after its launch in Sept. 2016 remains below-projected ridership numbers and dropping revenue, both from low fare collection and advertisers not renewing their contracts with the Cincinnati Bell Connector. Council member Greg Landsman -- who oversees Council's Major Projects and Smart Government Committee -- floated the idea of a special assessment for businesses and property owners along the streetcar route to help boost incoming revenue. Landsman said he would suggest deferring any advancement of that idea to the new, incoming streetcar "CEO," a position he said the city is "very close" to filling. The "CEO" position was part of a larger proposal Landsman advanced last year, calling for a massive restructuring of how the streetcar is managed and operates. Landsman proposed the restructuring after it became clear that the current arrangement did not place accountability for the streetcar's success on a single person or body. As the streetcar operates now, the city owns the streetcar, and the Southwest Ohio Regional Transit Authority oversees operations, which are carried out by a third party, public transit operations firm Transdev. Assistant City Manager John Juech last spring described this management dilemma as not having "one neck to choke." The city is also in the process of evaluating its operations and management agreement with SORTA in order to determine whether the city should take over direct oversight of streetcar operations from the transit authority, Landsman said. Vice Mayor Christopher Smitherman called for a report on such a "divorce" last June. City Manager Patrick Duhaney reported in November that removing SORTA from the streetcar's management structure would be "expensive and time-consuming." Council member David Mann renewed a call he first made last spring, suggesting that making the streetcar free to ride might boost ridership. "When can we stop charging fares from riders?" he said, pointing to Kansas City's similar streetcar system, which does not charge a fare. "Their ridership there has been phenomenal." The Council committee Tuesday did not take any action on the streetcar management. Landsman promised a more detailed report on the status of these proposals would be forthcoming later this week.